The first big article I ever put together was about using stripping baskets on a trout stream. At the time, I was using a stripping basket–basically, a big bucket you wear around your waist–to help manage line on rivers like the Clinch in East Tennessee, where really long drifts of really little nymphs can produce lots of trout in some pretty slow water. Since then, I’ve largely abandoned my stripping basket fetish, mostly by teaching myself better line management techniques with my left hand. However, there are still many times when the basket is useful, especially for anglers using shooting heads who don’t have boats (like most shore-based saltwater anglers). What should a stripping basket be? First, the basket needs to keep line from tangling. Some do this with fingers in the bottom, others with loops or even ridges, but every good basket has this in common. Second, the basket needs to keep line in place. Usually, this means fighting the wind, but sometimes a basket must also resist waves or splashing water. Most manufacturers (but not all) have handled this by giving the basket fairly high walls. Finally, the basket needs to be wearable. It’s possible to seriously (and dangerously) overkill on a stripping basket, especially if it’s too big and heavy in moving water, where it can fill and drag an angler under. (We’ll talk about boat-based line tamer buckets in a later post). For years, anglers made do with Rubbermaid tubs with holes for belts cut in them and weed-eater line punched as loops into the bottom. This is an effective basket, but surprisingly, you can save money by buying a ready-made model (try pricing the parts some time). 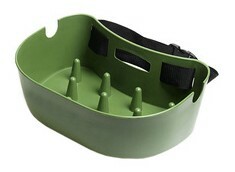 The most bulletproof stripping basket ever made is Orvis’s poly-plastic gray bad boy, historically about $40 (pictured above). This bucket is good at many things, like being rigid and providing quality line management, but it’s also heavy, prone to flooding, and practically impossible to fly with. L.L. 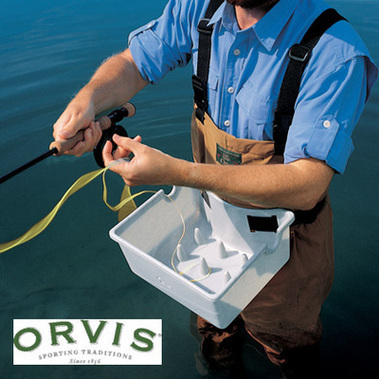 Bean briefly made a $19 knock-off (pictured, in green) of the Orvis bucket which many anglers felt to be the perfect storm; it was lighter, slightly smaller, but still just as rugged as the Orvis benchmark. Unfortunately, it is no longer available (and it still wasn’t packable). TFO/Mangrove partnered with a very innovative designer named Stan Pleskunas to bring his smart, folding foam model to market. I’ve never used one of these personally but I know the majority of the reviews were good, with predictable caveats about durability. The last style of stripping basket is–to me, with all due respect–the one you only use as a last resort. 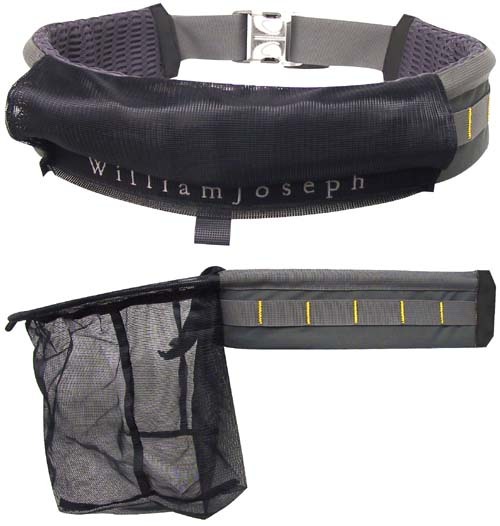 Several companies, including William Joseph, have made popout all-mesh baskets which can collapse into a belt. Conceptually, this is a great idea, because you can store the basket when it’s not in use (very important in crashing waves if you wind up swimming). Functionally, the darn thing just doesn’t work; with no fingers and a soft bottom, line rolls and piles up in heaps, while the mesh allows water and wind to wreak havoc. As a result, you can only have a minimum amount of line in these soft-sided buckets, rendering them more than a little pointless. On the balance, my preference is to use the hard-sided Orvis/L.L. Bean models whenever possible, despite the drawbacks of weight and bulk. When traveling, I’d rather have a foldable foam or plastic model. The mesh basket idea might work well with a little refinement (for instance, a pop-in floor with fingers), but as presently available, I’d stay away. What is your favorite stripping basket model? Why? Let us know in the Comments section!